Phillip K. Tompkins is well known in the field of communication and beyond because of his long and exciting career as a professor, researcher, literary critic, and author. 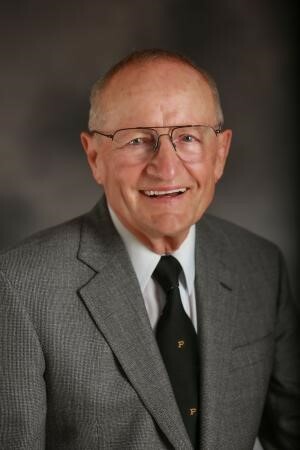 After achieving his Ph.D. in organizational communication from Purdue University in 1962, Tompkins was a consultant to NASA working under the legendary Wernher von Braun during the development of the Saturn V (the “moon rocket”). Throughout his career as a professor, he maintained productive research programs at Wayne State University, Kent State University, the University of Albany, Purdue University, and the University of Colorado at Boulder. He has continued this record since his retirement in 1998, producing three books with the most recent being Managing Risk and Complexity through Open Communication and Teamwork. In his book, Tompkins presents a powerful theory of open communication and teamwork. This unites a range of communication practices and principles that have proven to combat risk and complexity in organizations. Dr. Tompkins enjoyed his formative education at the Brian Lamb School of Communication. He especially appreciates the opportunities he was afforded by meeting great scholars and having the opportunity to learn from their advice. This advice and experience impacted his career in significant ways. He was honored to lend his name to this series to provide the same experience for the current graduate students in the Lamb School. Each year a Purdue alum is selected by the graduate students to reflect upon their own career and share words of wisdom to current students.